For lead manicurist Casey Herman’s second visit to NYFW, she kept up the colorful nail art from her previous collaboration with DEGEN and China Glaze. 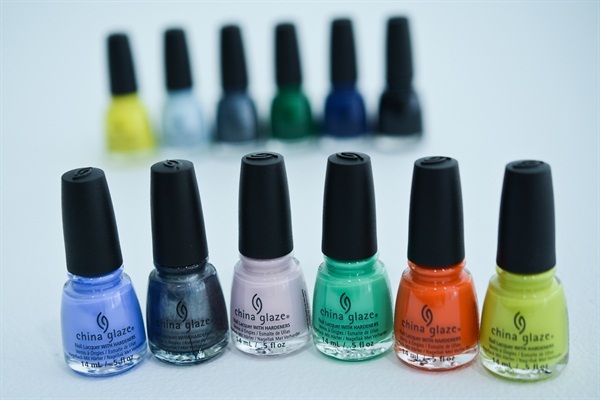 Herman chose a bold, graphic stripe in various China Glaze shades to create a rainbow thread-like nail art design. 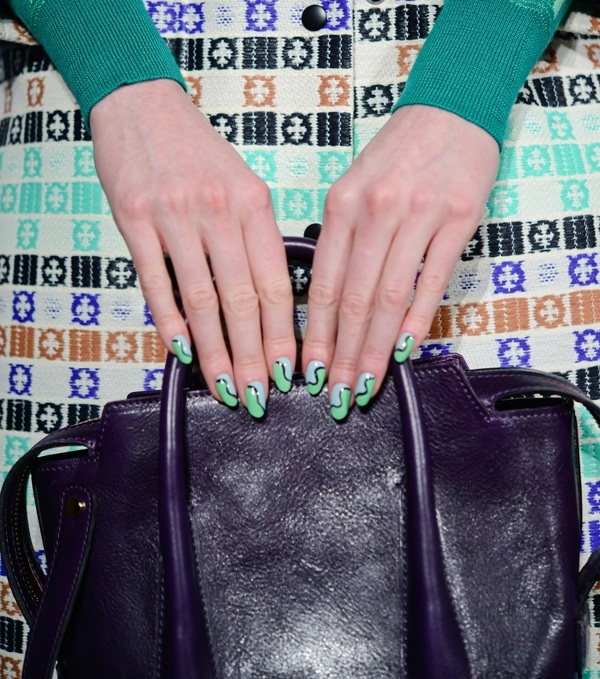 The common thread between every manicure was the accent nail all the models (even the males) wore. Accent nails were designed as a bold, single tonal stripe. All the nails are different, yet relate to each other, just like the whole of the fashion collection and like people in general. To get the look, apply two coats of Daisy Know My Name? over base coat. Then, use a thin striping brush to create a line down the center using Liquid Leather. Continue creating stripes alternating shades and thickness, being sure to leave space between to reveal the base colors. Seal with top coat. Shades used at DEGEN incorporated core colors and yet to be released shades, including: Daisy Know My Name?, Treble Maker, Boho Blues, Paper Chasing, First Mate, Out Like a Light, Awaken, Dashboard Dreamer, Trip of a Lime Time, Pop the Trunk, Wanderlust, and Liquid Leather. At Novis, Herman was drawn to the ruffles and patters in the clothing collection. As a result, Herman created ocean-like waves on nails. 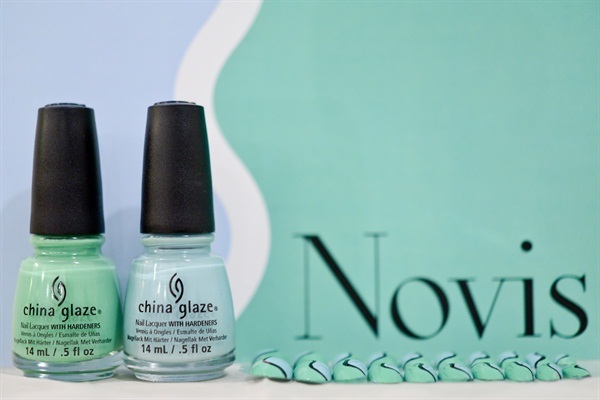 To get the look, apply two coats of Kinetic Candy to prepped nails. Use a thin striping brush to make the “S” shape across the nail in Liquid Leather. On the side of the nail closest to the tip, fill in with Shore Enuff. Herman recommends using the striping brush to get the polish as close to the edge of the “S” shape as possible, then use the polish brush to fill in the rest. A layer of Fast Forward Top Coat seals the deal. For an up-to-date Fashion Week recap, click here.